We start by creating helper methods to get the message stream and extract the data from this stream, by using an xpath query. Fortunatly, this can be done very easily by using the XPathDocument, which will do this nicely in a streaming way. Special thanks go out to Mohamed M Malek, whose code I adapted for this. This code will get a stream from the incoming message, making sure it creates a readonly stream if the incoming data stream is not seekable. /// Get the message stream from a BizTalk message. The next method will execute the xpath query, and will return the first result. Do notice, only simple xpath queries can be executed, f.e. indexes don’t work, and probably other filtering etc. will not work either. /// Extract the contents of a node selected by an xpath query. /// The query does not support indexes, and probably other more "advanced" queries. Now we can use these methods to retrieve the wanted value from the incoming message, and write it into ReceivedFileName in the context. This way we can use it by using the %SourceFileName% macro on the send port. I have 1 property on my pipeline component, XPath, so we can set the query to be executed on the sendport. This can be used independantly off the adapter on the receiveport, f.e. 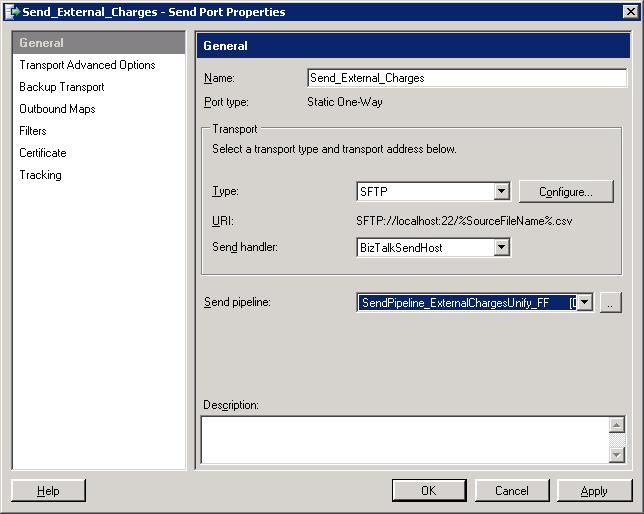 in our scenario we received the message from a WCF service, and write our outgoing message to a SFTP location. Now in the execute method we will set ReceivedFileName in the context with the extracted value. Now after creating a pipeline with the new pipeline component, we can use the %SourceFileName% macro on the sendport, and it will use the value as it was found in the message. This entry was posted in BizTalk, Uncategorized, XSLT / XPATH by Eldert Grootenboer. Bookmark the permalink.